Yesterday I did a short Facebook Live broadcast where I talked about 5 steps to making better email marketing for your art. Here’s the short video. It’s a short little video where I talk about what each of those things mean, and then I introduced the TAA Email Marketing Challenge. Daily emails with quick actions. No long instructions. Just a few quick thoughts each day to keep you moving forward. Thanks for the mention, Cory. We really appreciate it! Hi Secret Society! Just visited your site and signed up. Looking forward to hearing your tale! Thanks for this opportunity, Cory. I really got so much out of the Instagram challenge. 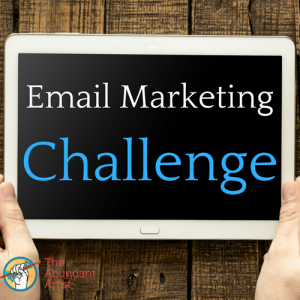 Looking forward to this email challenge! You rock!